I just love French lentils cooked with loads of garlic and thyme, when served along with baguette slices, i can finish my lunch or dinner happily. Actually cooking lentils with garlic and thyme is a classic French dish, a super aromatic protein rich dish as crushed garlic cloves are sauteed with thyme leaves.French lentils works awesome for making some delicious salads as well. 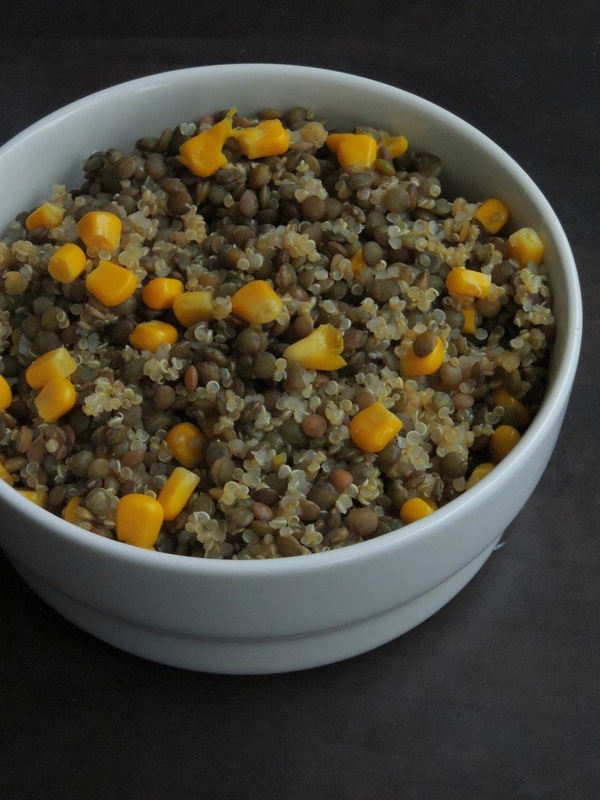 And my today's dish is a prefect dish to cook with this nutritious lentils. French lentils are also known as Le Puy Lentils which is easily available in all provisional stores here. Needless to say how nutritious this lentils are, obviously lentils are rich in protein and extremely rich in dietary fiber as well. If you are looking for a gluten free, hassle free, satisfying salad for your lunch or dinner, my today's post will definitely makes you happy. 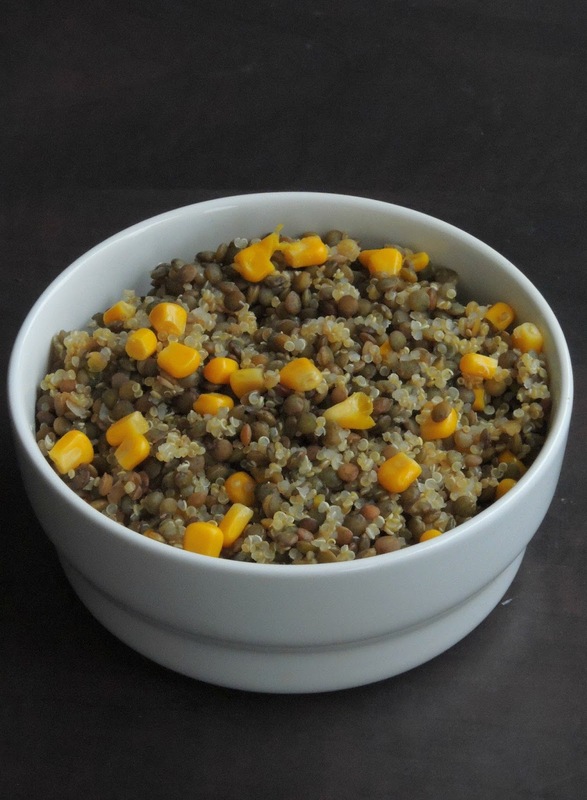 Simply cook both the quinoa and french lentils and serve them with a dressing by adding your favourite vegetables in it. With a grilled meat or simply grilled bread slices, one can finish his meal happily with this nutritious, healthy salad. I made a simple vinegar dressing to spice up this salad, make your favourite dressing and enjoy the goodness of both quinoa and lentils in your menu. Am running this week's blogging marathon with Lentil salad and sides and this salad is going for this theme. Cook the quinoa and french lentil separately until they gets well cooked. Drain the water and keep aside. Let them cool completely. 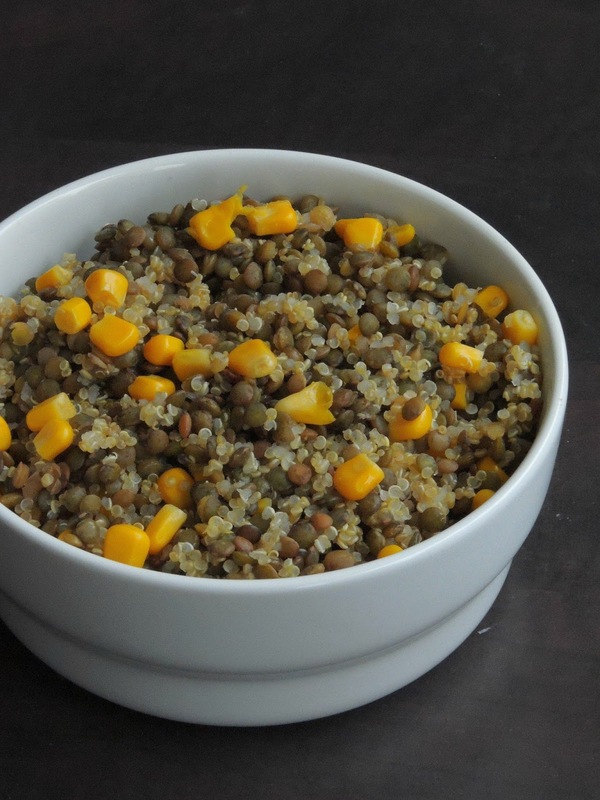 Take the quinoa and french lentils in a bowl, add in your choice of vegetables. Drizzle the dressing of your choice and toss everything well. Wow what a filling salad Priya...love the colour! Sounds interesting ! French lentils sound great and salad looks delicious . That is one healthy and filling salad with lentils and quinoa. Love the texture & firmness of French lentils in salads. That is my favored combination for a salad. Love it. Healthy salad.. Perfect for mid day hunger pans!! Definitely a healthy dish, looks so tempting !!! Sound interesting and looks healthy. That salad looks so delicious. Don't mind having it with some baguette. Yummy. I have made salad with French lentils. Love this idea of using quinoa with the french lentils. i m using quinoa a lot these days priya, love this salad, so comforting and colorful! Thats such an easy and healthy salad. Loved it. I am sure this made a filling and healthy lunch. Such a simple recipe!